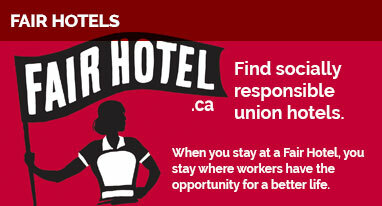 Vancouver, BC – Workers at the Four Points by Sheraton Vancouver Airport Hotel voted resoundingly to join BC’s hospitality union, UNITE HERE Local 40. In a vote count conducted by the Labour Relations Board this morning, workers from the hotel’s housekeeping, front desk, kitchen, banquet, restaurant and maintenance departments, voted heavily in favour of joining Local 40. “This is an important victory for Four Points workers who want to have a voice on the job and to be treated with respect and dignity in their workplace,” said Zailda Chan, the newly elected president of Local 40. Workers filed for an election in January after a new owner acquired the hotel and changed labour practices. Management cut back hours for senior workers and contracted out banquet and catering staff, whose pay then dropped to minimum wage. Four Points workers voted to join thousands of other Local 40 hospitality members who have won better conditions at work and a better future for themselves and their families. “Four Points workers, most of whom are part of Richmond’s Chinese and other immigrant communities, have taken the first step toward making a difference in their hotel. With the support of our union, they will now turn their attention to winning a good contract with fair wages and working conditions like other Local 40 members in British Columbia have won,” said Chan. This vote is the first to be announced for Unite Here Local 40 under the new presidency of Zailda Chan, BC’s first Chinese-Canadian union president.